I am a participant in several affiliate advertising programs designed to provide a means for sites to earn advertising fees by advertising and linking to products. Some posts on my site include affiliate links; if you click on the link and buy the item I recommend, I’ll earn a bit of revenue (thank you!). My personal policy is to only recommend products I have tried myself and that I believe would be beneficial to my clients and readers. I offer these links for your convenience, so I hope you find them useful. Originally published April 1, 2018. Updated and expanded, April 5, 2019. The first time I remember hearing about the gut-brain connect was in about 2002 or 2003. I remember that I was walking on the track at university, listening to a recording of a talk. The talk wasn’t about nutrition and I don’t remember any other information from it, but this was obviously an important moment because I can still remember it now. I wanted to abandon my exercise routine and head to the library or the computer – did we use google then? – to find out more. I remember trying to learn more about how the gut and brain were connected, but I couldn’t find much information. I was a busy full-time student focusing on technology and education, so I just accepted that there was a connection between the gut and the brain. It felt like it made sense. Maybe you also had a sense that there is a connection because we often feel emotions in our gut. For example, when we’re scared we can get a “knot” in our stomach. Or, feeling sad or anxious can affect our appetite and the number of bathroom trips we need to make. Plus, many digestive issues often come with mood issues. We know that our gut (a.k.a. digestive system) plays an essential role in all aspects of health – including brain health and mental health. I often start working with clients on their gut health because this is where our bodies break down and absorb nutrients from our food, and then get rid of waste. Without enough nutrition and all of our essential nutrients, we get deficiency diseases (that are not nearly as common now as they were just a few hundred years ago). When our gut does its job absorbing what we need, and keeping out what we don’t (and what’s harmful), it helps to nourish every single cell in our bodies. The microbiome is the collection of the genes contained within the microbiota. And technology developed in the early 2000s has allowed testing of hundreds of millions of gut microbiomes, where we used to be able to test just a few dozen. We now know that one person can have 1,000 strains of microbes with a total of over 1,000 trillion individual microbes in their gut. FUN FACT: Researchers don’t yet know what microbes make up an “optimal” gut microbiota, but are learning that overall realtionships between different type of microbes is important. First of all, our gut’s main job is to break down and absorb nutrients from our food and get rid of waste. There are a lot of nutrient deficiency disorders which have brain and mental health connections. For example, insufficient amounts of omega-3 fatty acids and certain B-vitamins are linked with brain and mental health issues. Second, many digestive issues seem to be associated with some mental health issues. A higher-than-average percentage of people with certain bowel diseases develop mental health symptoms of depression and anxiety. Third, we can also make observations about what happens when we disrupt those friendly gut microbes. Lots of people report psychological side effects after taking antibiotics. Antibiotics are often necessary to treat harmful bacteria. But, they don’t only wipe out those bad bacteria, they also wipe our our friendly gut microbes too. A fourth observation: what about the effect of stress on our gut? Stress can affect our appetite and even change the gut microbiome, and research shows that altered gut microbes are associated with mental health symptoms. Plus, studies are starting to show that probiotic supplements may help with stress and some mental health symptoms. Let’s look at each relationship separately. First, your gut has a lot of nerves and is sometimes called the “second brain.” All these 200-600 million nerve cells together form their own nervous system called the “enteric nervous system.” These nerve cells control the intricate functions necessary for your digestive system to do its job – from releasing digestive enzymes, to moving food through the digestive system, to regulating the blood flow that picks up the absorbed nutrients. The gut uses its own brain to function optimally. The second nerve connection between your gut and your brain is through the vagus nerve. This nerve physically connects our gut with our brain. The vagus nerve is part of the nervous system that controls the body subconsciously, called the “autonomic” nervous system (think “auto” as it it works “automatically”). This system is divided into two parts: sympathetic and parasympathetic. The sympathetic part controls our “fight or flight” reactions. The parasympathetic part, containing the vagus nerve, controls our “rest and digest” functions . Which makes sense, considering it links the digestive system to the brain. The vagus nerve has recently been shown to send about 80% of the information from your gut up to your brain – and not from your brain down to your gut as we previously thought! So, the communication starts in the gut, not the brain. The information travelling to the brain through the vagus nerve is from the gut as well as its microbiota. In addition to the physical nerves that surround our gut (enteric nervous system) and the nerve that carries info from our gut and microbiota to our brain (vagus nerve), there are biochemical connections. The first type of biochemical that sends information from our gut to our brain are neurotransmitters. “Neurotransmitters” are just that – transmitters of information between nerve cells. They are chemical messengers that allow nerve cells to communicate with each other. One of the most famous mood-affecting neurotransmitters, serotonin, is made in the gut. Serotonin is sometimes called the “happy” neurotransmitter because it seems to be lower in people with depression. Research shows that 90% of serotonin is in the gut, not in the brain! It plays an essential role, promoting the movement of food through the gut, which is called peristalsis. Another biochemical connection is between our gut microbes and our brains – through their metabolites. Our gut microbes need to eat, and in the process they produce compounds (i.e. metabolites). These include short chain fatty acids from dietary fibre, as well as amino acids from dietary protein. As mentioned earlier, they also create the essential vitamins B12 and K. All of these microbial compounds travel throughout our bodies and can reach and affect our brains. The third biochemical connection between our microbiome, gut, and brain – is through stress hormones. Our HPA-Axis (Hypothalamic-Pituitary-Adrenal Axis) starts in our brains and uses hormones like cortisol to affect other parts of the body, including the gut. Research shows that stress hormones tell immune cells in the gut to secrete compounds that can cause inflammation and tiny “leaks” in the gut (permeability). In addition to the physical nerve connections and the biochemical ones the microbiome-gut-brain axis also uses the immune system. I’ve written more about the relationship between inflammation and mental health here. Our immune cells travel throughout our body looking for unwelcome invaders like harmful bacteria and viruses. Just like most of our neurotransmitter serotonin is located in our gut, most of our immune system is there too. This is because our mouths are a huge portal for the outside world to get into our bodies. We can easily swallow disease-causing microbes which need to be dealt with by our immune system. So, it makes a lot of sense that most of our immune system is located around our gut. If our immune cells become overactive, this can cause autoimmunity and excess inflammation. Autoimmunity is when our immune cells mistake our own cells as harmful ones, and then attack them. This can also affect our moods. It is clear that ours nerve, biochemical, and immune system, are part of the complex microbiome-gut-brain axis! As you can see, there is a clear 2-way street between our gut and our brains, even though the details are still being discovered as we speak. From what we know already, let’s talk about what we can put in our gut to feed our moods, and what we can do mentally to help our gut. We know that a healthy diet is linked with a lower risk of mental health issues. 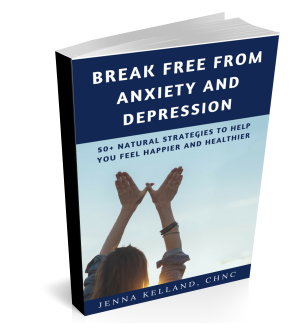 Several recent high-quality studies suggest that what we eat is a “modifiable risk factor” for depression and anxiety. This means that what we eat affects our risk of mental health issues, and we can control (modify) what we eat. Perhaps not surprisingly, foods associated with poorer mental health include processed, sugary, salty, fried, fast, and high-fat foods, as well as sugary drinks. A recent randomized clinical study shows that what we eat can help improve symptoms of people who already experience depression! They split the participants into two groups. One group was given seven nutrition counselling sessions and were asked to eat more higher quality foods and fewer poor quality foods. The other group was given “social support” only – they paired up with someone to discuss the news, sports, or even play cards or board games. While this was the first study of its kind, and had positive results, it will be great to have additional studies to confirm and expand on these results. Find out more about the SMILES study in this blog post. There is research specifically looking at probiotics and mental health. “Probiotics” are health-promoting microbes that we can eat, drink, or supplement with. They’re found in things like yogurt, sauerkraut, kombucha, kefir, miso, and kimchi (to see the recipes for fermented and probiotic-rich foods click on the mealgarden logo below). I’ve written more about probiotics and prebiotics for mental health and how fermented foods can reduce anxiety. There are a few studies have looked at the mood effects of people who take probiotic supplements. One review of 10 studies found that there are some mood benefits from probiotic supplementation. Another review looked at seven studies that compared probiotic supplements to placebo in healthy volunteers. The researchers concluded that there was a statistically significant improvement in psychological symptoms and perceived stress in people who took the probiotics. PRO TIP: If you have any health conditions, or are on medications, please check with your healthcare professional before taking any supplements. Also, everyone should read the labels before purchasing a supplement to ensure that none of the cautions or warnings apply to them, and to ensure they’re taking it as per the directions for use on the label. Now that we’ve looked at foods to put in our gut to help our mental health, let’s look at how stress reduction or improved mental health can help resolve our gut problems. As we’ve mentioned, gut issues can affect your stress level and moods, but it works the other way around too. If you have gut issues, then reducing your stress may help some of them. Irritable Bowel Syndrome (IBS) and Inflammatory bowel diseases (IBD) like Crohn’s and ulcerative colitis are considered to be “biopsychosocial” diseases. This means that they’re not just physical issues, but stress plays a key role in them as well. In fact, people with IBS have higher-than-normal levels of stress, depression, and anxiety. And, people who report high levels of stress can go on to develop gut issues. All of these can worsen gut symptoms by increasing the number and severity of flare ups. One of the most obvious impacts stress has on digestion is “transit time.” You may notice that stress can either quickly speed up how fast your food moves through you (diarrhea). Or, it may slow it down quite a bit (constipation). Neither one of these is ideal. So, even if you’re eating a variety of nutrient-dense whole foods, you may become nutrient deficient! And proper nutrition is needed at the best of times to support good mental health. Stress is also linked with tiny holes or “leaks” in your digestive tract. This means that incompletely digested food particles can get into your body through these leaks. This can cause a ton of inflammation, which we’ve already discussed as something that contributes to mental health issues. How does the microbiota-gut-brain axis work for these gut issues – or your gut issues? Stress influences many gastrointestinal functions. These include the microbiota, how well food moves through it (motility), secretion of important biochemicals, as well as how tightly the gut cells adhere to each other (permeability). Stress can also stimulate the sympathetic nervous system and the release of stress hormones, as well as inhibit the vagus nerve and contribute to inflammation. Basically, when you are stressed, your digestive system is much less effective. So, reducing stress is a strategy to reduce all of these negative effects and try to improve gut symptoms. Some experts say that the most effective treatments for IBS are “mind-body” therapies. Mind-body therapies include hypnotherapy, mindfulness, and cognitive behavioural therapy. Individual counselling or participating in support groups can also help. All of these approaches help to move your body from the “fight or flight” (what we tend to experience as high stress) state to a calmer “rest and digest” (unstressed or more relaxed) state. So, reducing stress using these techniques may also help to improve your digestion even if you aren’t diagnosed with a particular gut disease. Gut-directed hypnotherapy induces a state of relaxation while verbally suggesting improvements and coping skills. Mindfulness teaches how to observe one’s current experience, thoughts, and feelings, and to learn to apply neutral emotional attention to them. Mindfulness can help people to notice symptoms and sensations in the gut and distinguish those from the thoughts and emotions surrounding those sensations. The researchers are continuing to study this area, and I’m looking forward to hearing what they learn! There is lots of new research digging into these vast and varied interconnections between our gut and our brain. Like my Facebook page for notifications of new articles and research as I find it. The microbiome-gut-brain axis consists of nerves, biochemicals, and the immune system. This axis is a hotbed of research to try to really understand how our “second brain” affects our moods and vice versa. The microbiota-gut-brain axis is an active area of research now, but as we continue to learn more, I encourage you to make sure you treat your gut and your brain well.